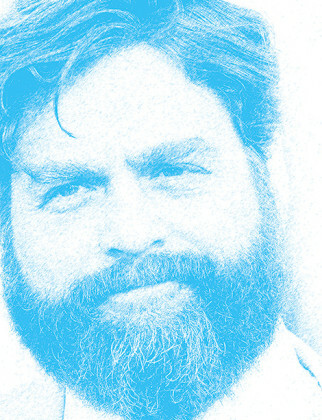 Zach Galifianakis doesn’t suffer fools gladly. And then for good measure he took out his belt and whipped Bieber. Of course then, Galifianakis also dumped green-slime on his head. He looks a lot like Chucky with a beard (“When you look like I do, it’s hard to get a table for one at Chuck E Cheese”) and usually acts like him when he’s onstage. His roles have been manic in everything from the Hangover movie franchise to parts in a string of TV shows both memorable and forgotten to various comedy specials and stand-up tours. But people like him anyway—not just his fans (though he berated the parents of some kid who asked him for an autograph because they let him watch the Hangover movies) and he is the least pretentious and un-Hollywood Hollywood star. Until recently he drove a 1997 Subaru that he once lived in for two weeks when he first arrived in LA. He already had a deal to do a sitcom but he didn’t want to rush his agent for the check. And he also lived in an Audi—that was left as a junker in a garage. Despite the Hollywood fame and pay checks, he now lives mostly on his farm in North Carolina, not far where he grew up in Wilkesboro, where his mother Mary Frances ran a community center for the arts and his father Harry sold heating oil. He also has a younger sister Merritt and an older brother, Greg. His cousin is Washington Post cartoonist Nick Galifianakis and his uncle Nick was a congressman who ran against Jesse Helms. Galifianakis attended Wilkes Central High School and attended but did not graduate North Carolina State University (he stopped one credit short) where he was a communications major. By the way, he flunked out of college by one class because he spent the day before heckling the teacher of that class at a church softball game. Confrontation and pushing the envelope is his mantra. He was mugged at gunpoint in New York City in 1995 and he refused to give up his money. “I don’t have any money,” he told the mugger (he had over $100 in his wallet) “and the cops behind me are watching you.” Tommy Blancha, a friend and writer, says Galifianakis’ lack of fear comes from a sense of fairness and a firm conviction that nobody is better than anybody else. In fact, he brings his big Greek family–parents, brother, sister, and even his cousins—most everywhere. He brought his parents and brother Greg to Thailand for the Hangover Part II shoot and the whole family to Atlanta for the shooting of Due Date. His father wanted him to play football and become a naval officer, but he did write to Johnny Carson to put his son on TV for being great in a Shields-and-Yarnell-inspired mime sketch for his elementary school talent show. So Galifianakis didn’t get his start in comedy by coming from a dark place in his home or his upbringing. He claims his initial inspiration was his high school buddy Jodi Brown. He told Galifianakis he was having an incestuous relationship with his mother. And there was the cousin who woke him at two a.m. and told him he needed to talk. “Is it a sin to talk to black people?” he asked Galifianakis. A typical Galifianaki stand-up routine might start with him putting down his backpack, troweling through his jacket pocket to find scribbled jokes, then slinging them out: “Hello, my name is Zach Galifianakis, and I hope I’m saying that right.”…”I was named after my grand-dad. Yes, my full name is Zach Granddad Galifianakis.”…”I want to combine the NAACP with Mothers Against Drunk Driving. It’s called Mothers Against the Advancement of Colored People.” He might be playing classical music on a piano while telling jokes or lip-synching “Tomorrow” while dressed as Little Orphan Annie (which he did on Saturday Night Live). And people something don’t know whether to laugh or cringe, but he doesn’t care. But he came up through the comedy trenches and he’s no pushover with himself or his fans. Once this big guy came up to him and told him to say something funny into his video camera. And Galilifianakis said no. And the guy got in his face and told him he owed it to his fans—which is the wrong thing to ever say to Galifianakis—who now got in the fan’s face—towering over him and all—until the fan skulked away. Jon Hamm, of Mad Men fame, has been a friend and seen him in performance for years and says this fearlessness, on and off stage, is what makes Galifianakis so compelling. Which is why he is asked to do the most alternative-comic stuff and his web show, Between Two Ferns, reels in the suckers despite his reputation. “Do you wish that you had ever followed your parents into comedy?” he asks Ben Stiller. Galifianakis made 1,500 bumper stickers that said “No Chain Stores in Venice” because he didn’t want them in Venice, California. He lit up a fake joint on Real Time with Bill Maher to show his support for legalized marijuana. It’s unconfirmed but he may have been the one on Hangover Part II who fought to keep Mel Gibson from doing a cameo, after the recordings were exposed of his racist rants. He very often doesn’t know what he’s doing next (he hasn’t used a publicist and answers his own e-mail) and he had a slew of offers (including the video with Kanye West), but the fame to him can be a drag. And Zach Galifianakis is funny in many cultures—but don’t ask him to fake-smile or mug for pictures on cue.